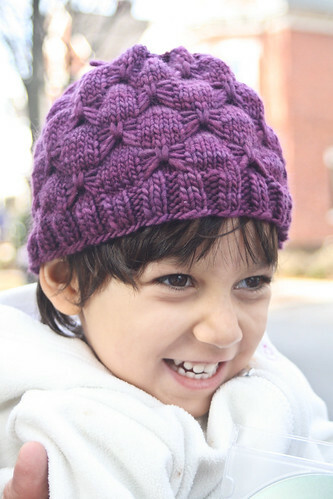 I've got to say that I really love the Pagoda, which looks a lot like the yarn you used for the purple hat. It's hard for me to choose just one favorite, but I'm currently enamored with "Whales Road" which is a heavenly mixture of teal, purple and blue. 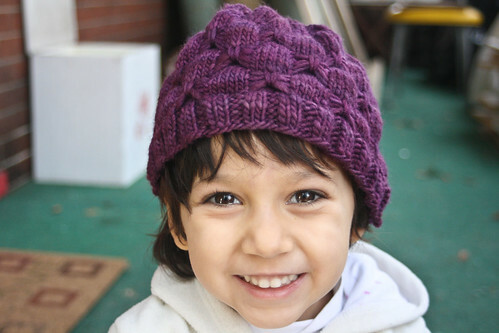 It's especially beautiful when knit into a hat! oh my goodness these children are just TOO MUCH. And good God do I ever hear you about malabrigo for accessories only. Even then - nothing that will get a lot of friction. I made the mistake of making some mittens out of it once and they are the rattiest things around now. What an adorable group of siblings. Those little hats are perfect, and the butterfly story very sweet. Such a heartwarming Thanksgiving Day gathering. I had to click over to the Malabrigo site to look at the colors. ::gasp:: So many gorgeous ones to choose from! I'll go with Azul Profundo. Which is cuter, the hats or the models? Hard to say, really. Seriously, you expect me to choose a favorite? You crazy. I am putting this hat at the top of my queue for a certain toddler who loves all things butterflies. Favorite shade of Malabrigo? Probably a tie between Lettuce and Azul -- for now, anyway. I love Lettuce, but that Pearl Ten..swooon..who can even say what color it is? Hard to choose just one, but I'd say Tuareg. Hats are my favorite projects and I love seeing all of yours. 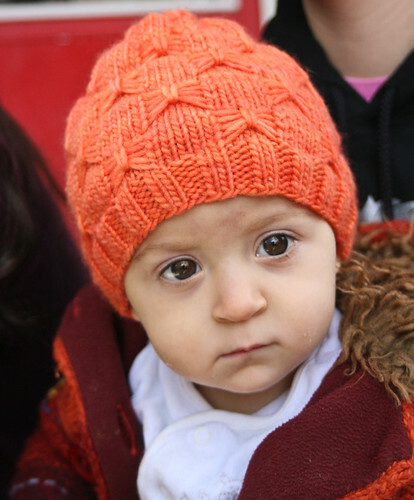 These hats are wonderful, and your little models are adorable! Uva is my current fav. Love purple! At the moment I'm knitting with Snowbird in the laceweight and it's stunning. Hmmmm, lettuce or geranio, hard to choose. Today I choose lettuce. Cute little girls! Another vote for Whales Road. But there is also a yummy grape I've got my eye on. Lovely photos. Great hat. Reminds me that I need to get working on a hat for myself now that it's getting colder. Perhaps in VAA. Would be pretty, I think. 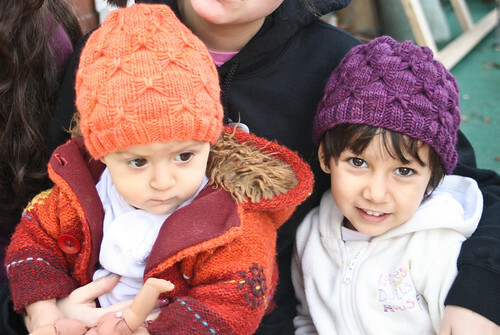 Those are such cute hats, not to mention such adorable children! 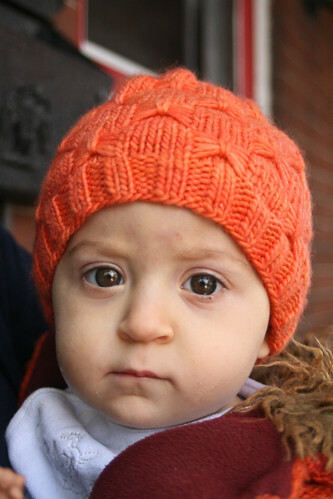 I knit a baby cardigan using a similar butterfly motif a while ago -- I'd like to try the hat, too. Mmmmalabrigo. You introduced me to Bobby Blue a while ago! It's gorgeous, and I also love azul profundo. I think pearl ten is my favorite! I have a sweater in malabrigo (damask) which I wear fairly regularly and so far the pilling is pretty minimal. Those children are too cute! and the hats are adorable! Paris Night I think. But I dream of one day finding Polar Morn. Just because it sounds so peaceful. The hat pattern is great! It's hard to pick a favorite color, but i have a great cowl in Fucsia! Hataí áille! (Lovely hats) I hope I'm not too late, Fucsia looks lovely. Thanks for the chance to win! plum, pearl, and azul profundo. i love sunset, too, but it washes me out like madness.